With the holidays just around the corner, you might be wondering about healthy Christmas snacks. Christmas and all of the food surrounding the holiday can derail even the most carefully planned diet. One of the best ways to keep yourself on track is to have healthy Christmas snacks on hand to get you through even the toughest situation. With the parties, open houses, family functions, treats at the office and temptations in the grocery store, the holiday season can be notoriously difficult to navigate without completely derailing your health and nutrition goals. Weight gain may appear to go hand-in-hand with the holiday season; however, there is no reason why gaining weight during the holidays should be an inevitability. By taking your own healthy Christmas snacks with you to each occasion, you can indulge without feeding your bulge or feeling deprived. Regardless of the type of eating plan you maintain - from low carb to low fat, there are ways to incorporate healthy snacks that will keep you on plan and keep your waist-line in check. There are a number of media resources to help find healthy Christmas snacks that fit in with your nutritional plan. A selection of plans are listed below with resources about where to find healthy snack ideas. Eating a low carbohydrate diet during the holidays can leave you feeling deprived as you stare down all of the sweet treats that are available as part of the Christmas season. Still, there are a variety of low carb treats and snacks that are an absolutely perfect solution for holiday parties. 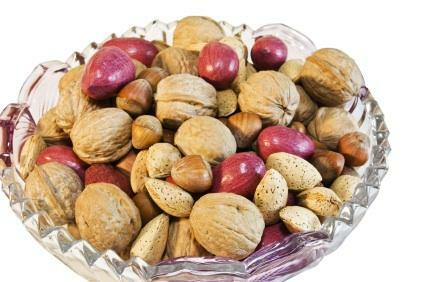 Nuts are relatively low in carbohydrates, especially when eaten in moderation. Recipes for spiced and sweetened nuts can be adapted using sugar alcohols such as erythritol, natural sweeteners such as stevia or artificial sweeteners such as sucralose in place of the sugar. Peanut butter, low carb protein powder and a little sweetener can make delicious peanut butter balls. The balls can then be dipped in unsweetened melted chocolate sweetened with a low carb sweetener. Verywell has a recipe for low-carb rum balls that are made with almond flour. There are cookbooks dedicated to low carb Christmas foods, including Low Carb Christmas Cookin' by Jan McCracken. Online low carb forums, like Active Low Carber forums have entire sections where members post recipes for the holidays all year. If you are controlling your weight by eating a calorie-controlled diet, then there is good news. The Internet is full of low calorie recipes. Most low calorie recipes control calories in several ways. They remove much of the fat from the recipe and replace it with a lower fat substitute. This makes sense, because fat is much more calorically dense than any other macronutrient. Carbohydrates and protein have four calories per gram. Fat has nine. They remove sugar and replace it with a low-calorie or calorie-free sweetener. There are a number of resources where you can find recipes adapted to a low calorie, low fat, portion controlled lifestyle. Cooks.com has a selection of low calorie recipes - many of which are holiday recipes. Cooking Light Magazine has both online sources and a print magazine. Their November and December issues usually feature a host of low calorie/fat-controlled Christmas recipes. Many diet plans, such as [www.weightwatchers.com Weight Watchers] offer information and recipes on their websites about Christmas snacks that are diet-friendly. If your goal is overall health during the holidays and not weight loss, there are a number of ways that you can give your Christmas snacks health makeovers. Revolution Health has an entire healthy living section that features makeovers of your favorite foods, including holiday foods. Disney's Family Fun magazine features recipes - including holiday recipes - that are healthy, whimsical and fun for the entire family. No matter what your reason for wanting to keep your snacks healthy this holiday season, there is a way to do it. Books, magazines and the Internet all offer ways to makeover your Christmas snacks so that you can stay healthy and happy this holiday season without feeling deprived.